In this Girl Scout Brownie Quest, there is are second - and third - graders traveling along two colorful trails, one they can enjoy on their own and one they explore as a Girl Scout group. Along the Quest, Girl Scout Brownies will meet three new friends, and a bright shining elf - in a brand new Brownie story meant to inspire their own Take Action projects. This Journey Book has 80 pages. What are the most important keys for a Girl Scout to own? This quest, which has second- and third-graders traveling along two colorful trails—one they can enjoy on their own and one they explore with their Girl Scout group—answers that question in a very special way. Along the Quest, Girl Scout Brownies will meet three new friends and a bright and shining elf—in a brand-new Brownie story meant to inspire their own Take Action Projects. The accompanying adult guide offers all the tips needed to create and maintain a sense of fun and mystery along the entire Quest. Instructions for a Brownie Brainstorm, Brownie Team Trade, and other activities ensure a quality and fun time for the girls. Are you familiar with the songs in the "Brownie Quest" journey? Even if you are, it may be helpful to have a refresher! The words can be found in the girl's journey book on page 67. Volunteers are welcome to download the sheet music (PDF) for use with girls at meetings, camp or for any other private, non-commercial use. All printed versions of the songs are to include the following:© 1999 Girl Scouts of the USA, Brownie Girl Scout Songbook, pages 9-10. Girl Scout Brownies are invited on a search. The three keys they will uncover along their journey are the keys of the Girl Scout leadership philosophy. Shhh! Don't give away the details! It's important to keep the fun and mystery going! 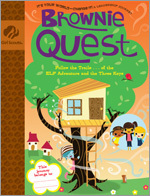 As Brownies move through the journey, the Quest Master Map offers a visual record of their progress along the Quest. The girls have their own mini version of the Quest Map in their book. The Discover Key – To earn this award, each Girl Scout Brownie will discover herself and her values—as a Girl Scout and a member of her family. The Take Action Key – To earn this award, Girl Scout Brownies will team up to identify a community place where the team can Take Action. Then they join together to make a plan to Take Action and carry out their Take Action Project to improve their world. The Brownie Quest Award – At the end of the Quest, the girls also earn the journey's culminating award, the master lock that needs all three of their keys in order to open. Through this award, the Brownies will see that, together, their three keys—Discover, Connect, and Take Action—unlock the meaning of leadership. * See the information on the ''LiA'' (Leader in Action) award. Cadettes have an opportunity to earn it by assisting Brownies on their Quest.